These heavy-duty clippers mean business. 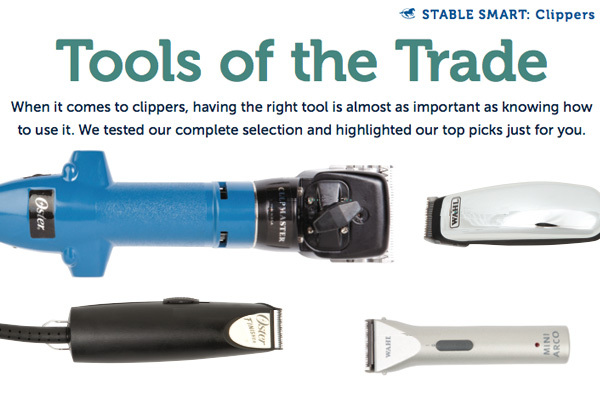 They’re definitely our top pick if you’ve got a full barn to clip. These pint-sized trimmers really kept their cool. With a mild running temperature and a very respectable battery life, they’re perfect for your pre-show prep! Swap out your 40 blades for T-84s and go from quick touch-ups and trims to full body clips with one versatile clipper. These cute and quiet clippers run on AA batteries, making them ideal for storing in your trailer, trunk or first aid kit. With a narrow blade and whisper-quiet motor, these handy trimmers are perfect for sensitive ears or head-shy horses. Looking for long-lasting power? On a single charge, this sleek and shiny cordless clipper runs for over two hours straight! For many riders, body clipping can seem like a daunting task. You want to keep your horse cool and dry after long rides, but may not know where to start. While it can be a lot of work, body clipping can also be a fun way to spend time with your horse. Read our Body Clipping 101 “how-to” for some great Clip Tips and a tutorial video on trace clipping and start clipping like the pros!